It’s hard to imagine Florida without Henry Morrison Flagler, the railroad tycoon whose transportation system and adjoining cities connected the poorest and wildest state in the country to the rest of the nation. The bronze archway over the main doors into Whitehall. These doors were attended by uniformed doorman. Part of the Standard Oil trio with John D. Rockefeller and Samuel Andrews, Flagler arrived in Jacksonville in the winter of 1878, hoping to revive the failing health of his wife, Mary Harkness. Unfortunately, the first Mrs. Flagler passed away three years later. Flagler returned to Florida, this time to St. Augustine, with his second wife, Ida Alice, shortly after their wedding. Recognizing the tourism potential of the state’s tropical climate, he gave up his day-to-day involvement in Standard Oil to begin building hotels along our coast (Hello, The Breakers!). However, Flagler needed a way to transport the original snowbirds from the frigid north to our sandy shores. No dummy, he quickly purchased the Jacksonville, St. Augustine, & Halifax Railroad, which later became the Florida East Coast Railway system – the railroad we still use today. Flagler worked his way down the coast, laying track and building hotels in St. Augustine, Daytona, and finally, Palm Beach. Legend has it that Flagler was convinced to continue his railroad to Miami by Julia Tuttle, the only woman to found a major American city. Mrs. Tuttle owned the land upon which the modern city of Miami is built. After two winters (1894 and 1895) of devastating freezes that wiped out the orange groves in northern and central Florida, Mrs. Tuttle sent Flagler oranges from Miami, showing him that the cold weather hadn’t touched her groves. Almost immediately, Flagler ordered his railroad further south. It was finally completed in 1912, when the tracks reached the island of Key West, with nearly 156 miles of the railroad constructed over water. Flagler played a major role in developing the cities along Florida’s Atlantic coast: Jacksonville, St. Augustine, Daytona, Miami. Yet, he chose Palm Beach as the location for his winter home, a gift to his third wife, Mary Lily Kenan. Named “Whitehall” for its ivory exterior, the mansion was a wedding gift to Mary Lily (setting the bar high for P). The home soon became a beacon of modern, turn-of-the-century technology in the primitive wilderness of South Florida. It boasted 22 bathrooms with indoor plumbing, electric lighting, indoor heating, and a telephone system – luxuries previously unheard of in the area. Almost single-handedly, Flagler created Florida’s economic foundation, providing the transportation infrastructure for our tourism and agricultural industries. Flagler died in 1913 at the age of 83 after falling down a staircase at Whitehall. He never recovered from his injuries and is buried in St. Augustine next to his first wife and two daughters. P’s favorite part of Whitehall, the ceiling of the South Hall. After Flagler’s death, Whitehall became a glamorous hotel. An 11-story, 250 bedroom tower was built to the west of the original structure. Flagler’s home became a lobby, bar, dining room, and entertainment area. In 1959, the entire building was in danger of being demolished. In an effort to preserve an important piece of Florida’s history, Jean Flagler Matthews, Henry Flagler’s granddaughter, formed a non-profit organization to purchase and save the property. 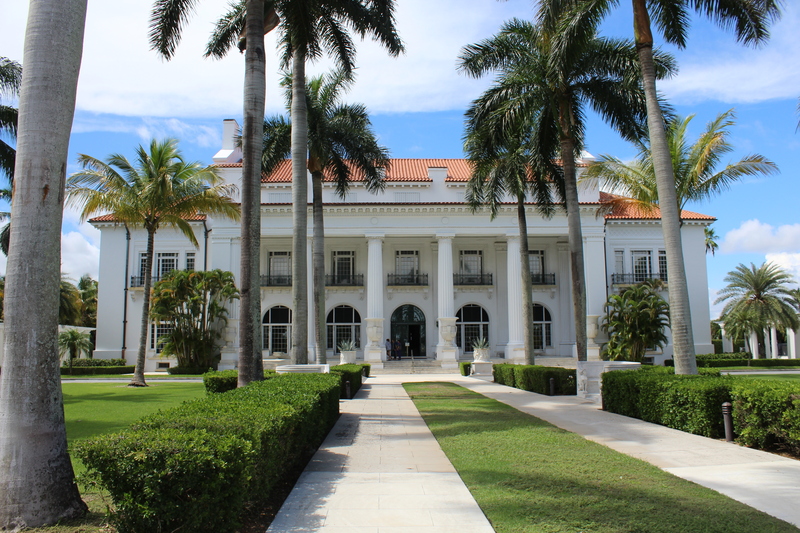 The Henry Morrison Flagler Museum opened in 1960 to much fanfare and celebration. Life Magazine even featured the event on it’s cover! P, reading up on the home’s transition from private residence, to hotel, to museum. If you’re looking for a quiet way to beat the “Florida fall” heat, take a leisurely afternoon stroll through the museum. Adult admission is $18 per person and guided tours are free of charge. The Grand Ballroom, which always makes me feel like Fraulein Maria in The Sound of Music. The view of the Royal Park Bridge from the recently constructed Flagler Kenan Pavilion, which sits adjacent to the museum. It houses Flagler’s personal railcar, Railcar No. 91, as well as a cafe that serves tea during season. The museum gives concerts on Sunday afternoons, April – November. Mr. and Mrs. Flagler’s Master Suite – it was very uncommon for wealthy married couples to share a bedroom at the turn of the century. The master bathroom, which contained the modern amenities of indoor plumbing, a telephone, a bathtub, and a shower. Yep, right here in good ol’ Florida. If you ever find yourself in South Florida, do let me know! Great article… excellent photography too!